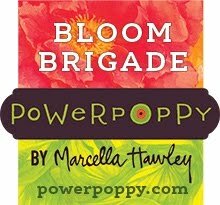 Today at Power Poppy we’ve got two fabulous rustic sets that just shine! They are full of cozy and comfortable images for Christmas. Pull out your warm flannels, first up, we have Snuggle Down! Here’s what Marcy had to say about the set: "Tartan plaid is on my mind! This set has two focal images - one is a stack of wool blankets with a lantern and sleigh bells. The other a grouping of retro Thermoses and the fixings for hot cocoa. Something really fun for this set - hand-drawn strips to make your own plaid backgrounds. There's a second set in this release called Through the Woods which would also work well with the plaid patterns”. Friends you will flip over how fun these plaids are! And the images are SO sweet! The set has lots of room at 5”x 6”. You will never have to go searching for the right designer paper match for a plaid - you can create your own in minutes! I created my plaid background to go with the way I coloured up my image in golds, greens, reds and warm grey’s with Copics. 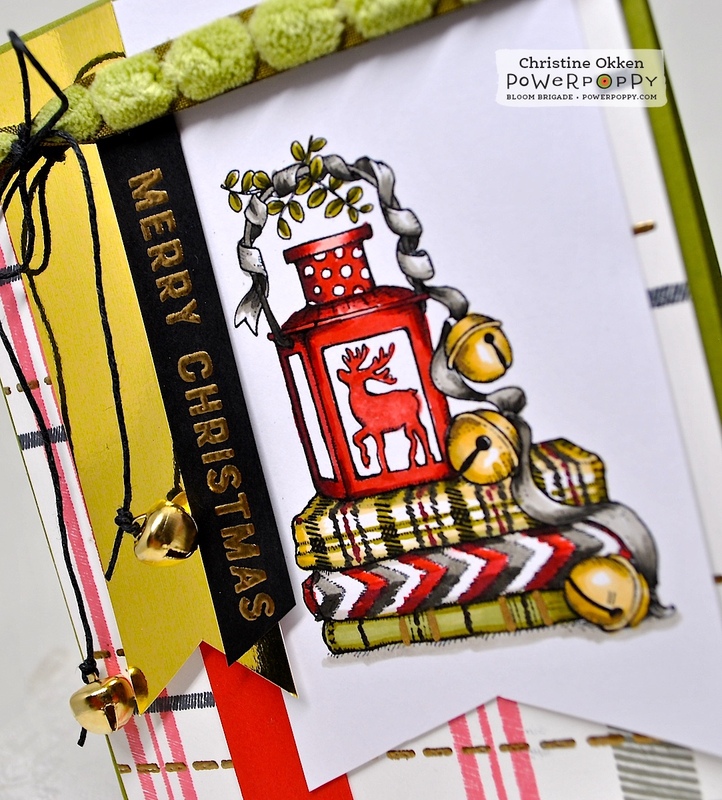 I even embossed the stitched rows in the background to match the gold metallic pen I used in the blanket stack. I pulled it all together with some green chenille ribbon, black cording, gold jingle bells and the sentiment from yesterday’s new set, Let Your Heart Be Light. And now we have Through the Woods! I agree Marcy! I coloured the tree up to match my plaids, and then added golden accents in the stars with a Krylon pen, metallic watercolour paint on the snow, followed by sparkly glitter. For embellishments I found some fun pink pom pom ribbon in my stash, a wood veneer heart that I inked up with white craft ink, and a tiny metallic star. There’s so much more in store with these two beautiful sets! These are both absolutely gorgeous. They just sing with Christmas spirit. 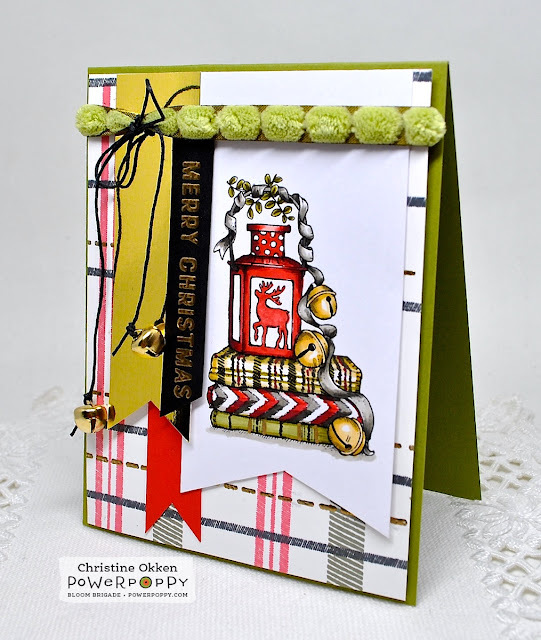 I'm completely in love with your cards and the look of these stamp sets! What fun to play with the plaid. Fabulous! These sets are SO awesome and I just love how you used them! Both of your cards are so bright and fun! 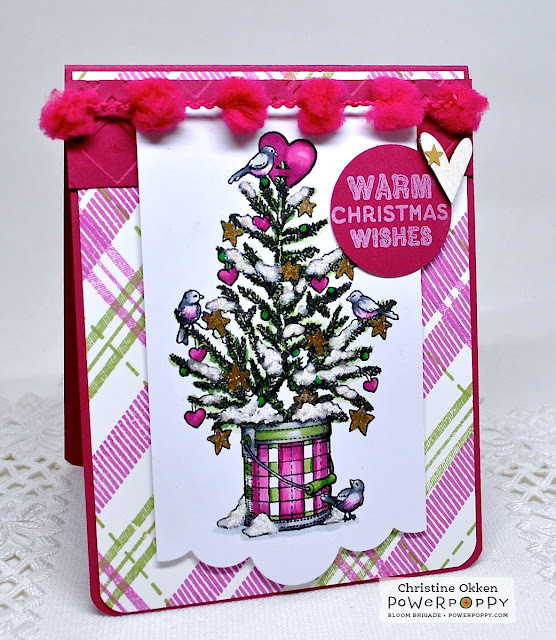 These are terrific, I love the pom pom borders on these, the bells on the first is perfect to go with the ones in the stamp, great design, love the sparkle you have added to the snow on your tree, so pretty! Super fun ribbons on both of these. Not to mention the coloring fantastic as always.